Prospect Hall is one of the new uk casinos which promised to deliver quality entertainment and transparent customer support, which they definitely did. We’ve first reviewed and listed this online casino a few years ago, and we’re still vouching for its promotional diversity and fairness. Recently Prospect Hall has added some new type of casino promos, more specifically tournaments and daily bonuses. We applaud the iniative, this was particularly what might have been missing all along. 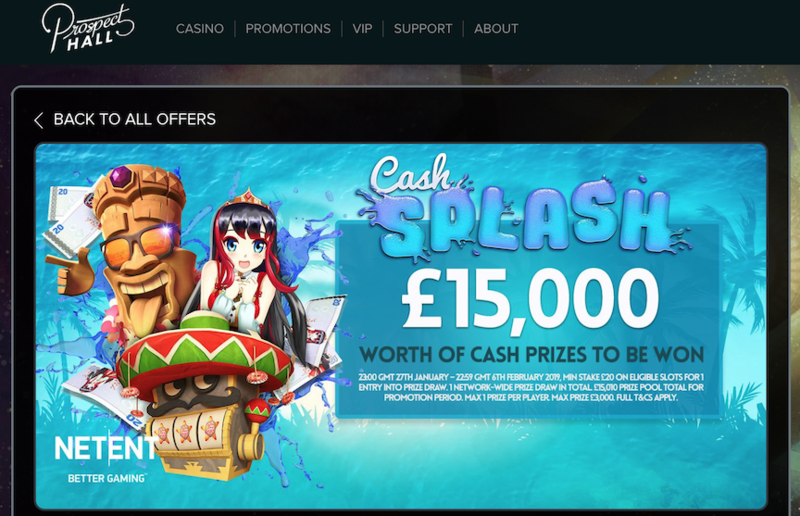 let’s have a look at the new Cash Splash event powered by Netent, where players are to expect a total of £15,000 cash prizes. The promotional timeframe takes places from January 27 to February 6. In order to qualify for the event, you have to stake at least £20 or more on the selected uk slot games. Each stake will get you 1 entry ticket for the raffle, maximum prize gets up to £3000 cash. Prospect Hall will reward a total of 1000 players who participate, which makes it a very generous promotion. In order to qualify, you have the wager on these 3 Netent slot games: Aloha! Cluster Pays, Koi Princess and Spinata Grande. The final draw takes place on February 7, while all cash prizes are credited on February 8. Also, a new kind of uk bonus which Prospect Hall has recently added was the Thursdy Happy Hour plan. Every Thursday (this month at leats) players can redeem 100% up to £20 match bonus from 8 pm to 11 pm. MAke sure to deposit and opt in for the promotion, this match bonus required a 40 times wagering before you can make any cash out. Enjoy all the new uk casino bonuses!